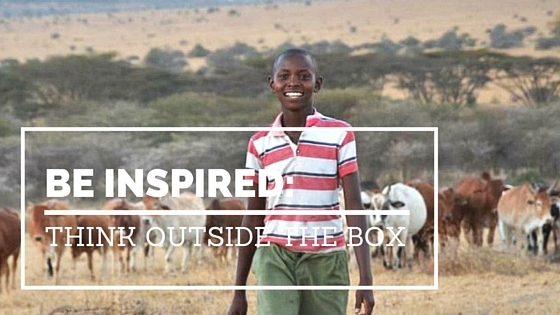 Richard Turere, a young Masai man, from Nairobi, shows that by thinking creatively we can not only solve our own problems but also help others and build futures. By being creative, observant, persevering and determined, he solved a problem which has been around for generations. He didn’t need a lot of money to do so, nor a formal education. All he had to do is look at the problem with new eyes and set his mind to solving it. It resulted in Richard saving his families cattle from being eaten by lions, providing them with food, wealth and status. He also sold his invention to other families, enabling him to earn money and help his community. He helped the lions who are now less likely to be killed by people protecting their livelihoods. And, he was noticed. Richard now holds a scholarship and is aiming to become an aircraft engineer. He started out by hating the lions. The simple solution would have been to kill the lions just like the strong men before him. Instead, he decided to think for himself and to find a new solution to an old problem. The thing he hated became the thing he loved. Lions gave him a problem which enabled him to find the solution that would enrich his life. You might also like this TED talk by Sakena Yacoobi who taught boys and girls despite the Taliban’s threat. That’s brilliant! What an ingenious way to protect livestock from lions, and lions from people. I also love Richard’s attitude. His easy smile makes him seem pleasant and likable. Such a brilliant post! And I love the video too, It was too good to not share on twitter. Thank you for sharing Mechteld. One can only imagine what this young man will accomplish..